I am back today to share my thoughts on Saving the Saved by Bryan Loritts. 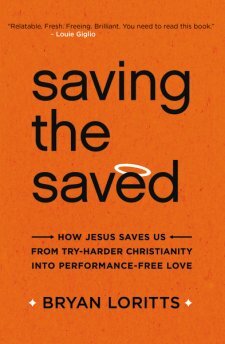 This book explains many common mistakes that Christians make: primarily trying to work our way into God’s affection, which just leaves us all exhausted. Instead, he proposes ways in which we can live happily in God’s performance-free love, while serving him out of love and not duty. He explains the importance of still doing service and good works, but we should be doing them out of a love for God, not because we’re trying to earn his favor (because that just won’t work). We do these things because of, in response to, God’s love. Serving God will usually require you to make sacrifices in your life, whether that’s giving away money and possessions, or simply forgiving a person when they’ve really hurt you. While it usually seems to go against our nature to do these things, Loritts explains how important it still is, and though it may be uncomfortable or even hurt for a time, with God we need to do it, and he will bring us through it. One extremely important message that I took from this is that failure isn’t final. There are so many examples from the Bible that Loritts gives that shows us that no matter how bad we mess up, or how many times, God will still love us, and we are able to change and come back to Him. Bryan Loritts has a very friendly tone and uses many personal examples to explain a lot of his concepts, which I always appreciate. To me, that type of writing is so much easier to relate to and apply to your own life. It reads like a friend giving you advice and being completely honest, rather than a textbook pointing out your faults and telling you that you need to shape up while pretending that they’ve never made those mistakes. I gave this book 4/5 stars. I really did enjoy it, and I learned a lot from it. It’s funny how a book like this can come into your life at the perfect time for your situation- it definitely did for me. I would definitely recommend this book. *I received a copy of this from the publisher via BookLook Bloggers in exchange for an honest review.